Before we wrap up Christmas in July, I wanted to gather some resources for finding holiday fabrics. Here's a round-up of favorite shops and their holiday and Christmas sections. 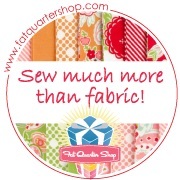 - Fat Quarter Shop "Christmas Cloth"
Please let me know in the comments if I forgot anyone! 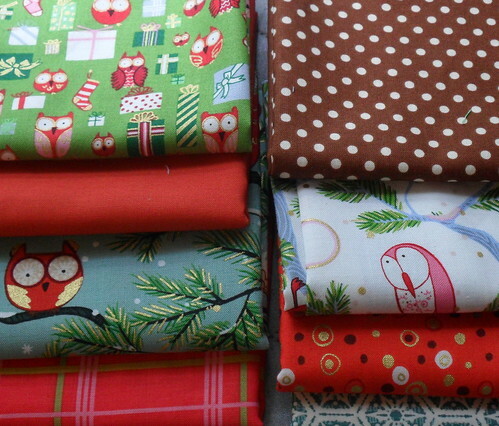 And speaking of holiday fabric, don't forget to enter the giveaway from Alewives Fabrics for a Holiday Hoot fat quarter bundle. Comments close at the end of today! I followed your suggestion and have been putting some thought into what I'd like to accomplish before Christmas comes around so that I don't have to scramble at the last minute. I've been pinning all kinds of stuff to my Christmas board on Pinterest (you can follow me here) and it's been helpful in gathering ideas. I loved seeing your ornaments in progress! It looks like we're moving forward at about the same speed. With my mom coming back through town to celebrate her birthday a few days ago, and then Ben's 4th birthday celebration yesterday, it's been a crazy week. My Little Birds Garland is close to done though. After stuffing and finishing one bird, I decided to do the rest assembly line-style. I'm doing the blanket stitch around them all, then will stuff them all, then will finish them all and tie them into a garland. I didn't know how to do a blanket stitch before this project and am so glad I learned! I love this look. 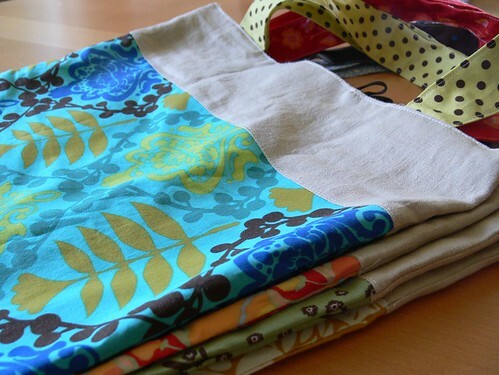 When we were prepping our Christmas in July series (by the seat of our pants, that's how we fly, oh yeah), we contacted one of our favorite fabric shops out there, Alewives Fabrics, to see if they'd like to join in the fun. Not caring one bit about the last-minuteness of things, Rhea jumped in with enthusiasm and assembled a little something to give away to our readers! Yay!! To celebrate our last week of Christmas in July, Alewives Fabrics is giving away a super fun Holiday Hoot Fat Quarter bundle. There are 8 fat quarters in the set, including 3 different owl prints from Alexander Henry's Holiday Hoot collection and featuring coordinating dots, solids and prints! The color scheme is traditional Christmas red and green with an added twist of gold, blue and brown. Welcome to all our new friends visiting from Pinterest, TipNut or other spots! We hope you'll enjoy yourself, subscribe and like us on Facebook for updates. Happy browsing! Hello Angel and friends! How was your weekend? How many ornaments have you made so far? 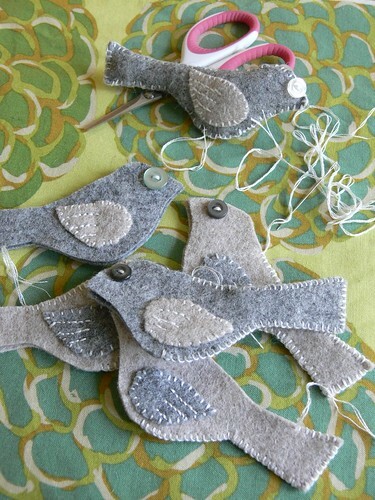 I have been making steady progress with my Little Birds Garland and hope to show you the finished result later this week. I love hand-stitching in front of the TV at night, it's such a nice way to wind down. If you have ornaments or other Christmas projects to show us, please share some pics in our Christmas in July Flickr pool! As you know by now, Lark Crafts is generously sharing a few patterns from Amanda Carestio's wonderful book Fa La La La Felt with us for our Christmas in July series. We've already shared the Layer Play ornament pattern designed by Laura Howard and the Little Birds Garland pattern designed by Lisa Jordan. 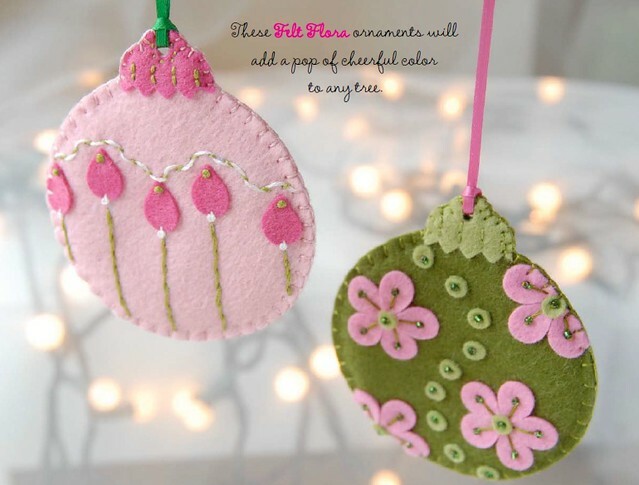 Today we are sharing two ornament patterns: Felt Flora and Merry Little Ornaments. FINALLY! Some progress on my Christmas in July projects! After a wonderful, whirlwind visit, my niece and mother left Seattle yesterday and I found myself with some free time during one of those miraculous simultaneous naps by the boys. Yippee! I turned on some music, lit a candle (getting romantic with my old self! ), grabbed some candy and a cup of coffee and... sat down to thoroughly enjoy a little bit of handwork! Breathe a sigh of satisfaction with me, would ya? Aaaah. I decided to go with a simple color combo rather than a whole rainbow. The result is interesting, quite different from the original design. Not sure if I like it. Just like you Angel, I had issues cutting even circles (as you can plainly see!) and it bugs the perfectionist in me to no end. Hello Angel and friends! I hope you all are having fun making ornaments! Who's gotten some Layer Play baubles done? I know Angel has some to show us, and I should too this week (I'm so behind on everything, you can blame my mom and niece who've been visiting!!). If you have ornaments or other Christmas projects to show us, please share some pics in our Christmas in July Flickr pool! As you probably know by now, Amanda over at Lark Crafts is generously sharing a few patterns from the wonderful book Fa La La La Felt with us for this fun Christmas in July series. I love this project and am so excited to get rolling! I haven't decided on my felt colors yet, I am debating between a combination of bright colors or a mix of heathered grey and sand felt. In any case, I think the embroidery and button details are just lovely. What about you, will you make the garland or the ornament variation? Tell me in the comments! The designer of this ornament is Lisa Jordan. You may remember that we featured her incredible needle felted artwork during Felt Week. We're excited to be working with her pattern! Make sure to check out her Lil Fish Studios blog and shop if you haven't yet. Check back in this week and next for more Christmas-related links and projects. You can check our previous Christmas in July posts here. 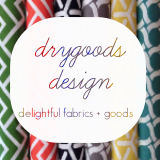 And don't forget the giveaway from Fashionable Fabrics here. If you're visiting Stumbles & Stitches for the first time, welcome! We hope you'll subscribe and come back. You can also find us on Facebook and Twitter. Happy browsing! Good morning and happy Monday! I hope you all had a lovely weekend. Today we're happy to share a little giveaway with you. 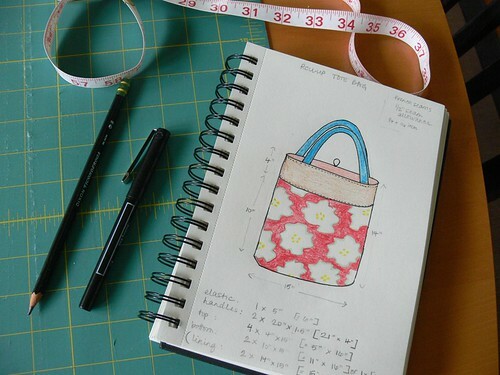 Fashionable Fabrics is offering a $25 gift certificate to one lucky Stumbles & Stitches reader! Fashionable Fabrics is an online fabric boutique specializing in "designer fashion fabrics at fashionable prices". They also have a lot of sewing patterns and books in stock. In the spirit of our Christmas in July series, I checked out their Christmas fabric section. They've got some fun prints as well as Christmas-y dots, stripes and damasks from designers like Riley Blake and Alexander Henry. Dennis and Tonia, the owners of Fashionable Fabrics, have two boys. So, as you can imagine, they are drawn to boy-friendly prints. There are lots of fun boy fabrics in their shop, like Rashida Coleman-Hale's I Heart Robots, Riley Blake's Alphabet Soup, Marty Goes to Mars by Camelot Fabrics, and much more. 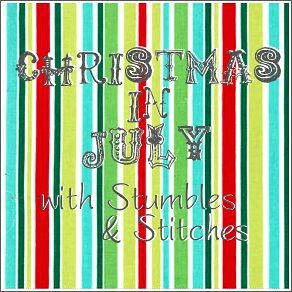 Thanks to Laura Howard for posting about Christmas in July, I think that must be where CraftGossip saw it! Thanks to both of you for the link. If you are new around here, hello! The original Christmas in July post is HERE (with a preview of the ornaments we'll be working on, so you can get your supplies together). The Layer Play PDF is right HERE and we'll post the next ornament PDF tomorrow. This week we'll also introduce you to the designer of the featured decoration, show you our progress, share some Christmas project links and we'll even have a giveaway! You can download the book Fa La La La Felt instantly (I used Zinio when I bought my digital copy last year) or buy it here, or check your local library. And, if you need to stock up on some felt so you can sew along with us, A Child's Dream Come True has offered $5 off your order total until July 31st. Just use promotional code FALALA. 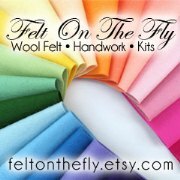 They have a full range of felt, my favorite is the Holland Wool 100% wool felt, they have 61 colors. Have a great Sunday, everyone, see ya tomorrow. Hello Angel and friends! I hope you all are ready to get rolling with some ornament-making! Did you get some felt and assemble your supplies? As Angel mentioned in our Christmas in July introduction, Amanda over at Lark Crafts in generously sharing a few patterns from the wonderful book Fa La La La Felt with us for this fun series. 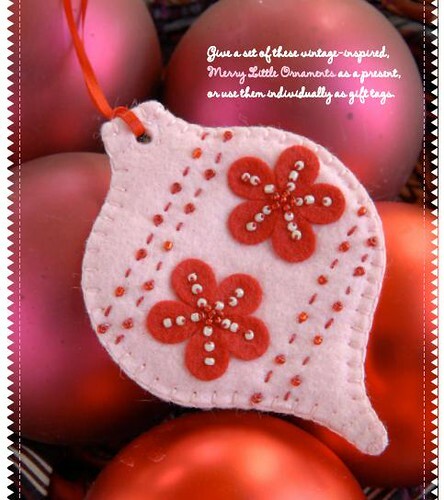 Our first ornament pattern is Layer Play (click here or on the images for PDF pattern). 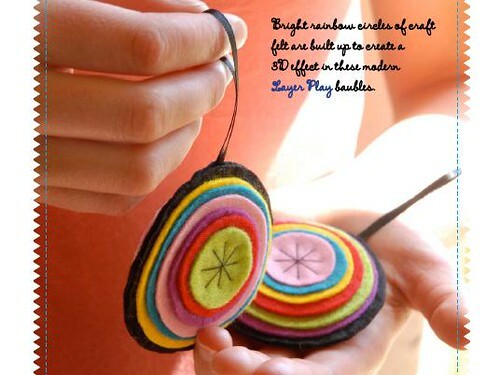 As the book describes, bright rainbow circles of felt are built up to create a 3D effect in these modern baubles. Every year around the Winter holidays, I wish I had started making things earlier. The cute tutorials and gift ideas seem to hit the blog circuit right around Thanksgiving. By then I am usually too busy with other things (like enjoying the holidays!) to make as many things as I'd like, especially gifts and decorations for the house. So this year, Jenny and I thought it'd be fun to have a little "Christmas in July" series on the blog. Let's get a head start on making things so we won't be so rushed when the holidays come creeping up. We've got a lot in store including projects, patterns and links to get you in the Christmas spirit. 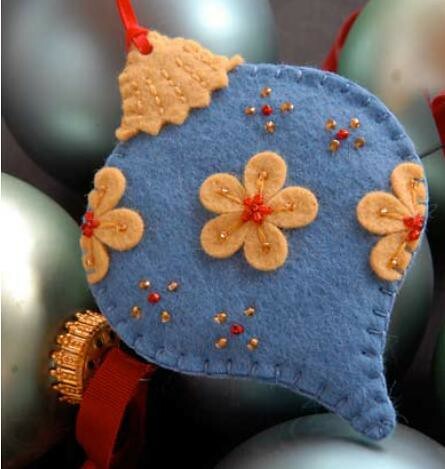 We're most excited about making felt ornaments from the wonderful book Fa La La La Felt. We'll be sharing PDF patterns from the book, thanks to Amanda over at Lark! We'll post the pattern and template for one project on each of the remaining 3 Mondays of July (2 projects for the last week). There will be lots of other Christmas-related crafting posts in between. So be sure and check in! 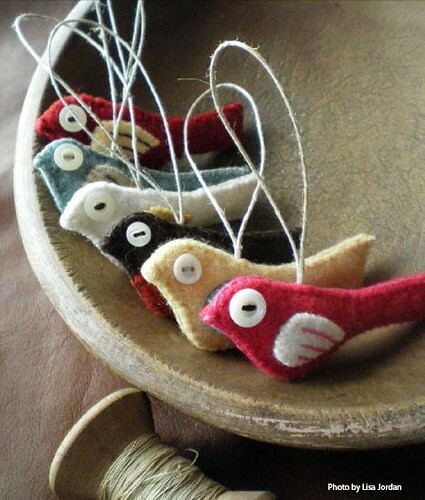 Wool felt is PERFECT for these four decorations. It is a durable, quality material: ideal for ornaments that will be around for years. I love working with wool felt so much. I know that not everyone has access to it at a local shop, so I wanted to show you the projects ahead of time so you can source your supplies. And get this: Debbie from A Child's Dream Come True is offering all our readers $5 off orders placed in July, with no minimum purchase! All you have to do is use the code FALALA at checkout. One 8 inch by 12 inch sheet of wool felt at A Child's Dream Come True is just $2.75, and Debbie has 61 colors to choose from. Fun! Take a look at the photos and see what colors you might need. 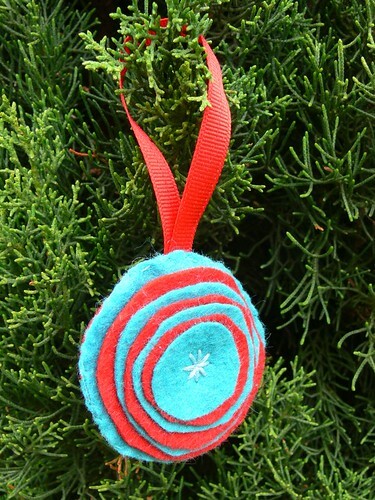 One 8 inch by 12 inch sheet of wool felt will make a few ornaments! 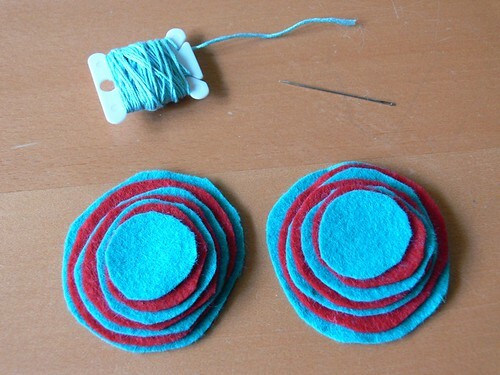 If you've wanted to work with wool felt, or practice your hand-sewing skills (or both!) this is your chance! And you'll end up with beautiful, handmade decorations to give as gifts or keep for your own home when the month is over. Aside from felt, the other materials you'll need are embroidery floss, seed beads, batting and ribbon, all easily found at your local craft store if you don't have a stash already. Let's gather those supplies! 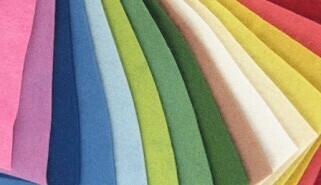 Make a list of colors you want to use, get your hands on some felt and check back here on Monday for our first project! If you have questions about how much felt you'll need for each project, leave a comment and I'll give you an estimate. 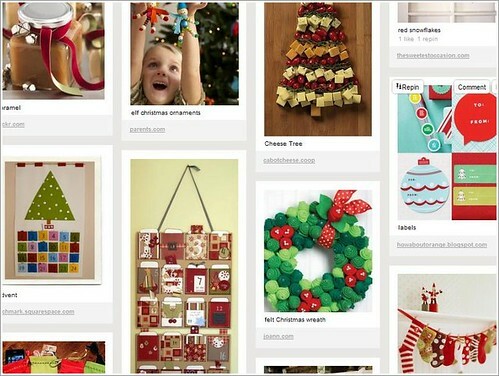 >> See all upcoming Christmas in July posts here. It is summer in Seattle and we have been enjoying it! Finally!! It's sunny and lovely and all the windows are open and I LOVE it. I have been taking my Spring Sampler along with me whenever I go outside with the boys, and I'll be sharing my progress on that soon for all our friends who are stitching along. Indoor sewing and crafting have slowed down quite a bit, but I do have a finished project to share with you! Benjamin finished his first year (or, really, few months) of preschool a couple of weeks ago. We loved his new school and his teachers so much that I wanted to make little thank you end-of-year gifts for them. 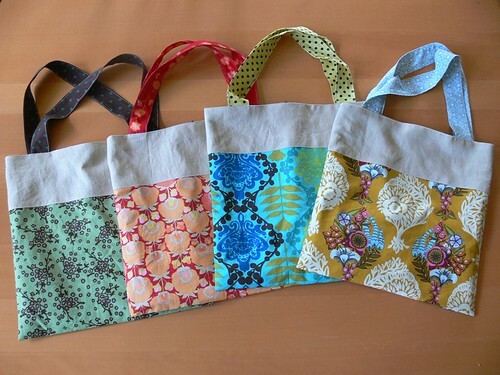 I decided to make roll-up tote bags since they are very usable and can showcase some lovely fabrics. Congrats to the winners of our Alphabet Glue, Volume 2 giveaway! The five winners are: Bargain Babe, Dawn, Diane, DaffodilAngel and Colleen! We will forward your information to Annie, thanks for entering.